...was born in 1879 in Germany. Simon Louvish wrote that the real name was Gustav Hohensalza, although others (including great-nephew Evan Edwards) says that the original name was Gus Simon and that Hohensalza was the town in Germany where he was born. The town is a health resort with saltwater springs and rock salt is mined nearby, hence the German name. The Polish name is Inowroclaw and the town chartered in 1267, was passed to Prussia in 1772 and reverted to Poland in 1919. When Gus was seven years old he and his family emigrated to the Williamsburg section of Brooklyn. During the day he worked in the family cigar store and in the evenings he wandered looking for any sort of show business job. Gus was 17 years old when vaudeville agent James Hyde saw him performing in Johnny Palmer's Gaiety Saloon, in Brooklyn, NY. He booked a tour for Gus and four other boys as The Newsboys Quintet act. In 1898, while performing in this act, Gus wrote his first song, to a lyric by Tom Daly, All I Want is My Black Baby Back. While entertaining soldiers at Camp Black during the Spanish-American War, Gus met lyricist Will Cobb, and they formed their "Words and Music", a partnership that lasted for many years. In 1903, they wrote some of the songs to an early Musical production of The Wizard of Oz. In 2003, producer David Maxine released a 2 CD set of this, including three of Edwards' songs - Pocahontas, Come Take a Skate with Me and I Love Only One Girl in the Wide, Wide World. The Wizard of Oz: 1903 Broadway Musical - Original Cast Recording was nominated for the 2004 Grammy Award for Best Historical Album. The fame of Edwards & Cobb was sealed in 1907 with School Days. With lyrics by Will Cobb and music by Gus Edwards, this song was the centrepiece of the Broadway Musical with the same name, which became the model of Edward's long-running series of kid acts. Staged by Ned Wayburn and written by Aaron Hoffman, School Days opened at the Circle Theatre 14 September 1908. This act was so successful that it ran for over twenty years. It consisted of a school room filled with young singers, dancers, actors, mimes, etc. Other Edwards-Cobb hits were In Zanzibar from Broadway musical The Medal and The Maid and I Can't Tell Why I Love You But I Do, written in 1900 and revived in 1944-film Belle of the Yukon. In 1905 Gus formed his own music publishing company and also wrote some tunes with lyricist, Vincent Bryan including Tammany. It became the theme song for New York's Democratic Party political club (where the song was introduced after Gus had written it in one hour), later interpolated into the Broadway show Fantana where Lee Harrison sang it. 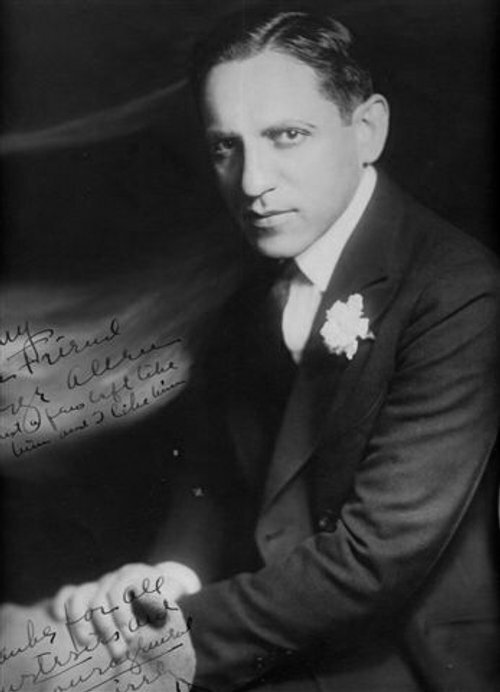 In 1907 Gus wrote the scores for Florenz Ziegfeld's first Follies show and for the Weber and Fields show Hip Hip Hooray. Between 1900 and 1920 more than three million Italians immigrated to the United States. One result of this wave of immigration was a change in New York's audience for opera with enthusiastic Italian immigrants filling the galleries at the Metropolitan Opera House. Documenting this demographic shift were operatic novelty songs that alluded to opera and were sung in vaudeville, musical comedies and topical revues. Some of the best operatic novelties were written by Gus Edwards and Edward Madden, who between 1908 and 1912 wrote songs that commented satirically on the star status of Enrico Caruso and Luisa Tetrazzini. A segment about this work called "Caruso and His Cousins: Portraits of Italian Americans in the Operatic Novelty Songs of Edwards and Madden", was part of a music symposium at Columbia University in January 2004. Over the years Gus scoured the country looking for new, young talent and found such future stars as Lila Lee, Eddie Cantor, Eddie Buzzell, George Jessel, The Duncan Sister, George Price and many more. He became known as "The Star Maker". Between April and June 1906, Edwards produced Gus Edwards' Postal Telegraph Boys. It consisted of eight boys in Postal Telegraph uniforms, indulging in "boyish pranks at one another's expense" and singing Edward's latest compositions in a telegraph office setting. 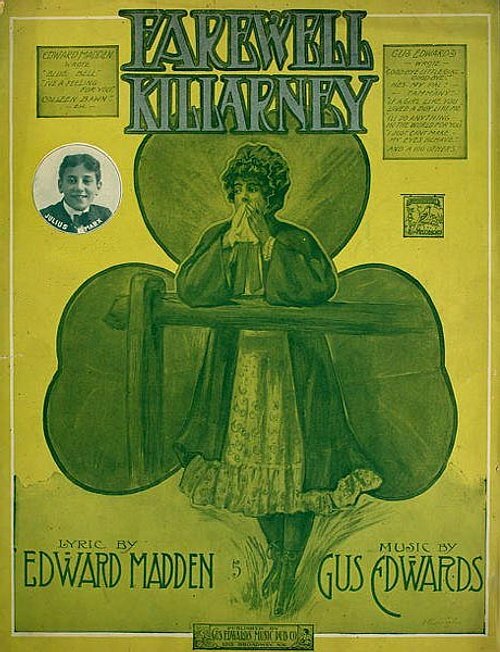 Groucho was one of these boys and his picture even appeared on the cover of the sheet music for Edwards' Farewell Killarney. 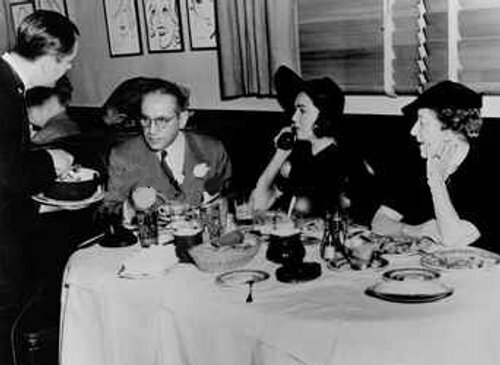 Groucho also had a fond memory of the song Somebody's Sweetheart I Want To Be, written by Edwards & Cobbs. On a benefit concert on 3 May 1906 in the New York Metropolitan Opera House for the victims of the San Francisco earthquake, Groucho sang the song to 3000 delighted spectators in front of a 70-piece orchestra. There's a 1950s or 60s TV-recording (available in Marx-documentaries) of Groucho telling this story and singing a part of the song. When interviewed by Charlotte Chandler in the 1970s for the book Hello, I Must Be Going, Groucho further recalled; "...it was a whole group of us. Gus Edwards had an act, with about eight people in it, and [George] Jessel was one of them. And we all entertained. At least, we thought we did. We didn't get any money. I remember chasing Gus Edwards once to get our salary." As we know, Groucho sometimes exaggerated in order to make a story more interesting and in the case of the Metropolitan Opera-appearance, he couldn't expect any salary anyway as it was a benefit performance. By 1910, vaudeville was full of schoolroom acts inspired by School Days. It was natural for a fledgling comedy team like the Marx Brothers to follow a popular trend and led by Groucho they made their own adaption named Fun In Hi Skule. "Hide your children, everyone; here c-c-comes Gus Edwards." This is a famous expression which most think had a positive meaning, something like "watch out parents, here comes Gus Edwards, and he might steal your kid for his show". However, Joe Frisco suggested something else according to his biography Joe Frisco - Comic, Jazz Dancer and Railbird by Charlie Foy and Ed Lowry (who once appeared with his first wife Irene "Teddy" Prince in School Days with Edwards. Loretta McDermott, Frisco's first partner and sweetheart, was among the thousands of teenagers who auditioned for a part in one of Gus Edwards' shows. Her complete performance in Song Revue (sp?) apparently was to sit starry-eyed on a piano, clad in nightcaps and pajamas while Gus played and sang about soda fountains and ice cream mountains. Lowry & Foy: "Gus had a way of convincing a doting mother to wait in the outer office while he had a little chat in his inner sanctum with the daughter. Whether Loretta gave Joe a sordid description of what went on during her "chats" with Gus we'll never know. We do know, however, that the very mention of Edwards' name used to rile Joe. One night Frisco was seated at the bar of a popular Forty-seventh Street restaurant and Gus Edwards came through the door. Frisco stood up on top of his chair and shouted loudly: "Hide your children, everyone; here c-c-comes Gus Edwards." In the "Essay on Chronology"-section of Joe Frisco - Comic, Jazz Dancer and Railbird, Roberta C. Martin tries to sort out the sometimes contradictory chronology that surround the length of Frisco's relationship to Loretta McDermott. Martin thinks that Gus Edwards' "advances" toward Loretta occured when she was still a teenager, several years before she met Frisco, and that the one of Edwards' many Song Review (sp?) in which Loretta had a very slight part was the one that debuted on October 3, 1914. It doesn't seem as Edwards and Frisco ever worked together; in fact they may have been rivals and all this probably influenced Frisco's opinion of Gus (although neither Lowry nor Foy seem to have objected). On the other hand, a man like Groucho Marx never said anything similar when reminiscing about Gus Edwards. In 1928 Gus went to Hollywood. He wrote some songs with lyricist Joe Goodwin and appeared in films like The Songwriter's Revue and The Doll Shop. He also directed several short subjects. In 1931 Gus went back into the vaudeville circuit and made some new discoveries, including the eccentric dancer Ray Bolger and the singing team of The Lane Sisters - Pricilla, Rosemary and Lola. Gus retired in 1939, one year before Paramount Pictures starred Bing Crosby in the film The Star Maker about his life. In poor health for the final six years of his life, Gus died on 7 November 1945 in Los Angeles, CA. Gus Edwards was well liked and famous enough to be portraited in a silhouette by famous artist Beatrix Sherman. He was thought of highly by the people he helped get into the business - with one notable exception; Walter Winchell was once fired by Gus Edwards for allegedly doing something inappropriate while part of Gus's troupe. When it was later determined that Winchell had been falsely accused, he was reinstated but apparently never forgave Gus for this slight. Many years later when Gus Edwards was having financial and health problems, he turned to Winchell for help but Winchell didn't want to help (which is documented in the biography of Winchell by Neal Gabler). However, in the memorial radioshow for Gus Edwards on 10 November 1945, Winchell spoke glowingly of him. In 2002, artist Laura Cantrell released a CD called When The Roses Bloom Again. The title track is a cover of an out-take from the Wilco/Billy Bragg collaboration Mermaid Avenue, which was dropped from the album of Woody Guthrie-penned lyrics when it was discovered that the song was actually copyrighted by A.P. Carter of the Carter Family. Another source claimed that the words were "Traditional" and that the music was composed by Jeff Tweedy. Further research has found that the song was previously published in New York c 1901 by E. A. Mills and credited to writers Gus Edwards and Will D. Cobb under the aliases Will Whitemore and Harry Hilliard. Then there is a 1926 version by country/bluegrass singers Burnett and Rutherford, who sang the exact lyrics of this song to an entirely different melody. So, could Edwards and Cobb have put their own music to lyrics of a folk or traditional nature that THEY had found? On the album Mermaid Avenue Vol II there's song called Blood Of The Lamb, which has the same melody as I'll Be With You When The Roses Bloom Again. The key and chord arrangement are different but it is clearly the same song root, probably reworked when they discovered the lyric problem with I'll Be With You When The Roses Bloom Again. Interestingly, Blood of the Lamb is credited to Bennett/Tweedy while I'll Be With You When The Roses Bloom Again was credited to Tweedy alone. Evan Edwards has even seen one website which has the credits "Words by Cobb and Edwards, Music by Jeff Tweedy". Evan Edwards is the great-nephew of Gus and lives in New York City. His father Jack Edwards was a songwriter whose songs were recorded by artists as his sister Joan Edwards (Go West Young Man, Go West), Steve Lawrence, Carmen McRae, Kate Smith, Al Martino, Neil Hefti, Merv Griffin and Vaughn Monroe (And So It Ended, a song co-written by siblings Jack and Joan Edwards). In 1953, singer Frankie Valli (before becoming the lead singer of The Four Seasons) made his first professional recording under the name Frankie Valley. The A-side was a song called My Mother's Eyes and the B-side was The Laugh's On Me by Jack Edwards. This song was also recorded by black vocal group the Delta Rhythm Boys in the 1940's. Jack Edwards also worked with legendary stride style pianist Willie "The Lion" Smith. They wrote numerous songs together, including The Zig Zag and Here Comes The Band a.k.a. Bring on the Band. Three of Gus Edwards' siblings were also involved in the music business; Ben Edwards, the father of Joan and Jack, was a well-known song-plugger in his time. Leo Edwards was a songwriter who wrote Isle D'Amour and The Jewish Indian, which was sung by Fannie Brice. Dorothea Edwards, who was over 100 years old when she died in 1982, was a singer with a very deep voice who did a version of Water Boy. So are the teardrops shining, Deep in your eyes of blue. I gave in the bygone years, Acushla! Just for love's sweet sake! Never a word of blarney, Softens the news they break. A certain William Sydney Porter (1862-1910) worked as a teller in a bank in Texas when he was charged with stealing money. Whether he was guilty or not has never been resolved as he jumped bond before the trial. His flight was taken as an admission of guilt. In jail he met a man called Jimmy Valentine. When Porter got out he moved to New York and commenced writing short stories under the name O. Henry. The story A Retrieved Reformation told what happened to Jimmy Valentine after he got out of jail. He intended to go straight after cracking one more safe in an old bank in a small town but he met a girl and they both fell in love. As it happened, she was the daughter of the bank president. The banker took a liking to Jimmy and decided to give a party at the bank for the two in love. The party would introduce Jimmy to everybody and the banker would also show off the bank's new time safe. Jimmy's girlfriend's sister was at the party with her two young children, who were playing hide-and-seek right in front of the open safe. One of the little girls ran into the safe to hide when another child pushed the safe door and it swung closed. A call was put in to the police and to the people who installed the time safe. The word was that the time safe could not be opened until 24 hours later. As Jimmy watched this tragedy unfold, he had to make a quick decision. Could he open the safe, and if he could, should he? It would show him up as a safe cracker. He rubbed the tips of his fingers against the adjacent marble wall, turned the tumblers and felt the clicks that revealed the combination. The safe popped open and the little girl danced out, unaware that she had just sidestepped death. Standing back from the crowd was a man he recognized, the detective who had put Jimmy in jail two years ago. Jimmy walked over to him and said, "You saw it all, and now you must do your duty." The detective said, "Yes, I saw it all. I thought I recognized you, but I see I have made a big mistake. You are a better man than the man I thought you were." The Jimmy Valentine story, was a natural to be made into a play. O. Henry was tempted but if the play was successful, his double life would be exposed. He sold the rights to a playwright for $500, and the story was dramatized and renamed Alias Jimmy Valentine. It was a Broadway success and many years later a 1930s movie. Gus Edwards saw the play and it inspired him to write the song When Jimmy Valentine Gets Out with lyrics by Edward Madden. It was the hit of the 1911 season and also sung by Bing Crosby in the movie The Star Maker.